Wikipedia: It is used as a raw material for thatching roofs. It is used for making baskets. Plant has medicinal value also. Its fibre is used for making ropes. 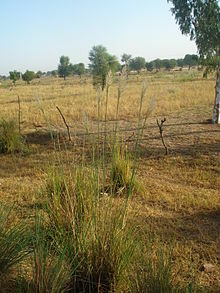 Saccharum munja, - a perennial wild grass, is one of the ecologically successful native colonizer of the variour abandoned mine. it forms pure patches on rocky habitats with skeletal soils. it forms extensive root network that binds the soil/pebbles and forms tall thick clumps with high biomass tufts. it is used by low income locals for making ropes, hand fans, baskets, brooms, mat, hut and shields for crop protection. Saccharum munja is a choice species for vegetation and stabilization of erosion prone rugged slopes and their conversion into biologically productive sites of high socio-economic values.